Both U16 & U18 routes have been designed to be challenging and hence are set at the top of grade for the age groups. The U16 race is run on decent paths for its full length, the U18 race is mainly on good paths with the section between CP1 & CP2 being more open to route choice. The routes have been designed to make the younger racers feel inclusive with the main event. Both races will start with the main race up to CP1 where the U16 turn left up the main descent path. The U18 race turns left at CP2 of the main race. Both then join the main race route at the summit of Moel Famau for the descent back to the waterworks finish. 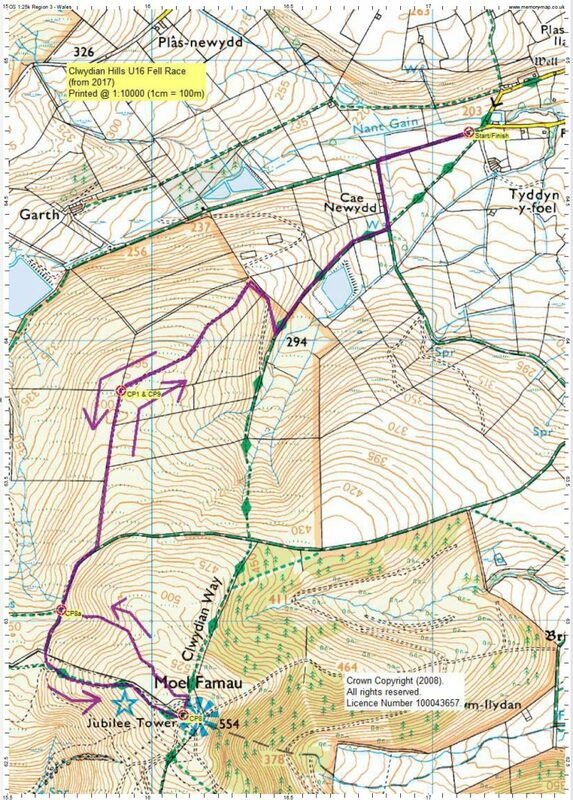 Both courses will be partially marked (more so the U16) and are run on decent paths and tracks hence although fell running experience will be beneficial it is not deemed necessary for either race. Obviously these are challenging youth races so entrants should be used to regular runs of a similar fell distance or greater road distance. Offroad/Fell shoes due to the steep descents from the summits and below checkpoint 1. Flat soled trainers are not suitable. The U16 route runs to the first checkpoint of the main race before turning up the descent path along the northern spur. Contours along the main traverse path to the main ridge (Offa’s Dyke) path before heading up the steep final slopes of Moel Famau to the summit checkpoint. Descent is by the main race route descent back down the northern spur. The route is nearly an out & back except for the mountain top where a small circular loop is added. 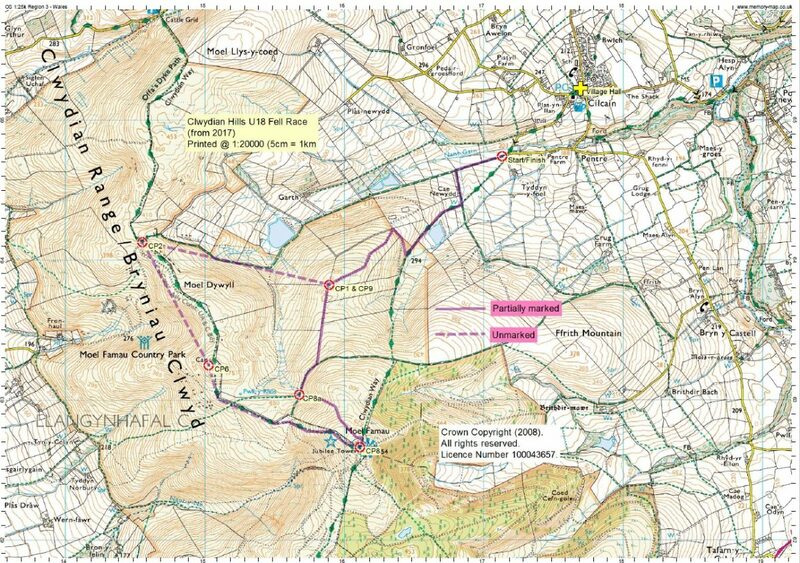 The U18 route runs the first 2 checkpoints of the main race before turning left up the main ridge along the Offa’s Dyke path to Checkpoint 6 on the summit of Moel Dywyll. From here it continues along the ridge and (joins the U16 route) up the steep slopes on Moel Famau to the summit checkpoint 8 before descending the main descent route down the northern spur.